Are you a fan of history and the outdoors? We are. As a family, we especially love our local history. Today we ended up with a free Saturday afternoon, so we decided to go to a nearby cave. Little Bit and I had been there before, but my husband hadn’t. 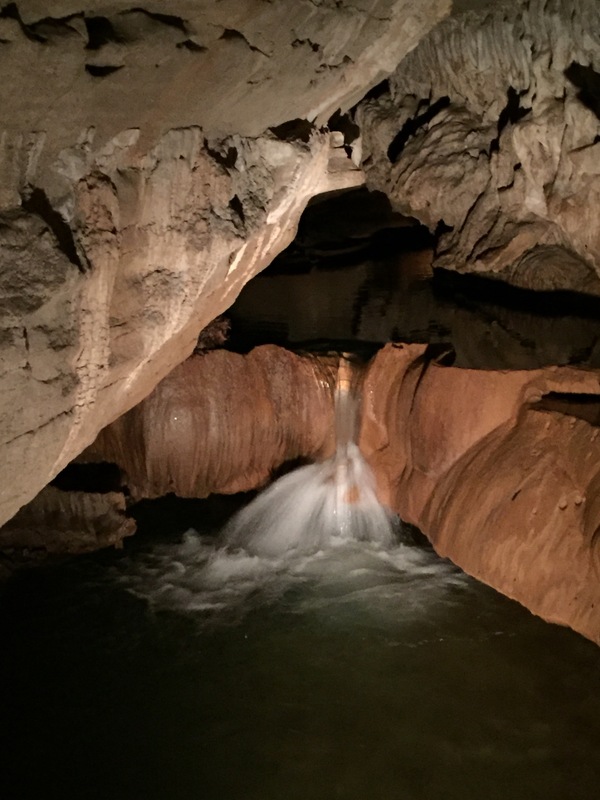 I just have to say, that the cave is truly one of those instances where Mother Nature outdid herself again! Part of the reason it ranks right up there with my favorite places is because from the road you can’t see anything and would never even know it’s there. The surprise of it lies up the path. The tour starts out near the building and the sidewalk bends around to the overlook where Henry Rowe Schoolcraft would’ve come up the creek. At that point, the tour guide tells the history of how the cave was discovered. 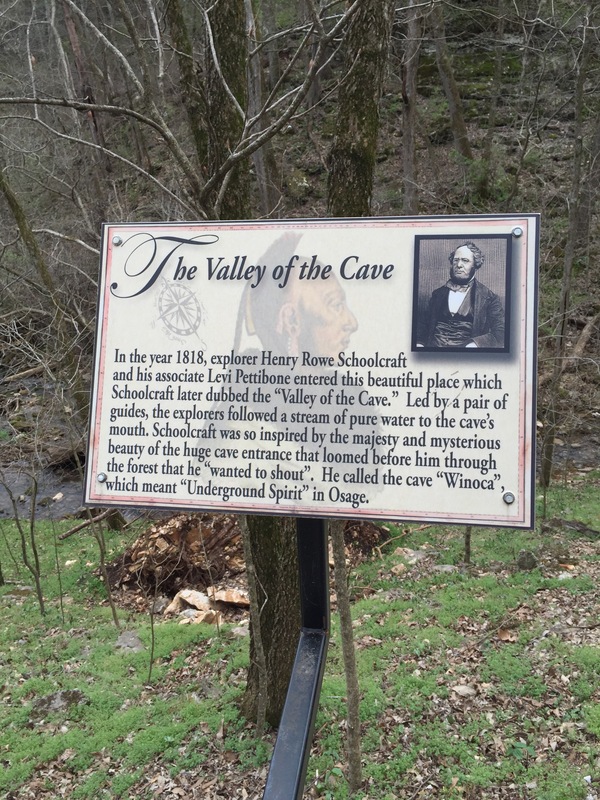 A walk around the next corner shows what Mr. Schoolcraft would’ve seen when he came upon the cave in the 1800’s. It is pretty cool to imagine being in an explorer’s shoes over 100 years ago. The cave entrance is quite breathtaking. I’ve seen it three times and it still drops my jaw. At some of the other caves we have been to, we’ve had to crawl in. Not this one! It is massive. One step inside and it’s easy to see why people have been drawn to it for so many years. It’s sort of homey. For a cave, it is filled with a large amount of light. One of the stories I really like, is about how over 90 years ago families would meet there after church. They would spread their quilts on the floor inside, near the entrance and picnic. I love the idea of families gathered there to cool off from the summer heat. Further back the guide talks about how the Native Americans used the cave and there’s also a formation with names from the 1800’s carved in it. 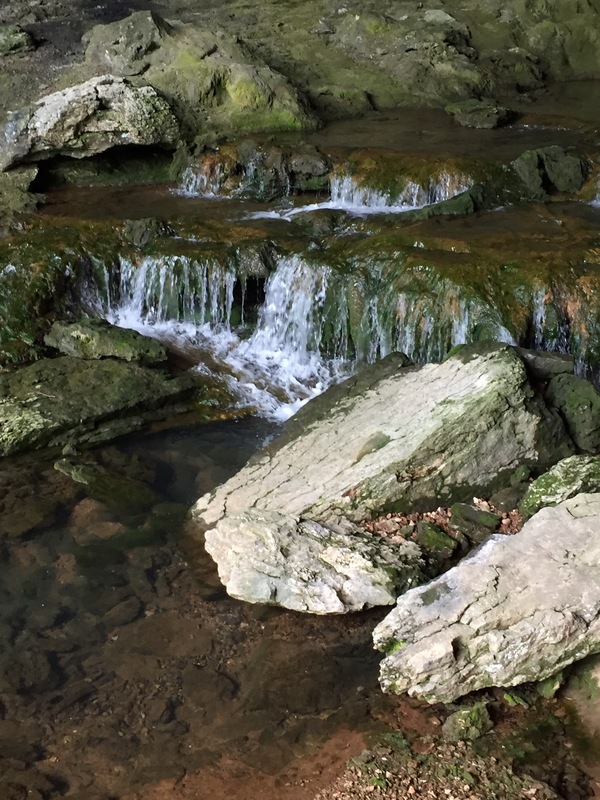 At the back, there is a small, but powerful waterfall. And, for just a moment, they shut the lights off just to show what it was like before electricity graced the cave. It was really neat to look at the ceiling and see sharks teeth and starfish. Also, throughout the tour, we saw bats, cave crickets, and newly hatched salamanders. I feel quite lucky that we live in a place near so much natural beauty. What a wonderful day we spent as a family, going cavin’. Had I lived there a century ago, I would have made my home inside the cave! It would’ve been a beautiful place to live. On http://www.smallincave.com under the archives there are some photos that are pretty neat. Also, it’s been on magazine covers in the 1920’s and 1950’s I believe. It’s a pretty amazing place. Tons of history. 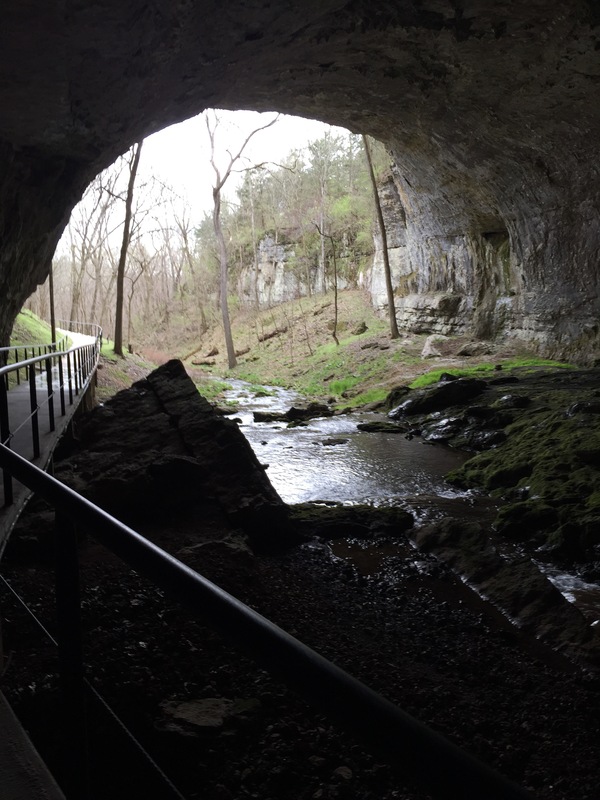 Most caves in the US stay about 55 degrees Fahrenheit year round. Very comfortable. Oh man! That really looks awesome! Thank you! Great photos Jessica and what a wonderful experience for you all. I’ve been underground in a few caves, some I’ve felt claustrophobic in and others I’ve felt absolutely awe inspired in. Mother Nature is absolutely amazing. I figured you were a caver, Miriam, with your adventurous spirit. :) Love how Mother Nature is so impressive above ground and below. So very true Jessica. Hope you have a wonderful week ahead. Lovely photos, Jessica. I have nothing against BIG caves either and have seen some wonderful ones in France. Some friends go potholing and have asked if I wanted to tag along – no way! I read more about Schoolcraft and his fascinating varied life – very open-minded. His wife, Jane, was also known as Bamewawagezhikaquay (Woman of the Sound the Stars Make Rushing Through the Sky) – now that’s one heck of a name. Beautiful. Thank you, Annika. Wow! I’d love to see caves in France! I don’t blame you about the crawling around in them. That’s more my husband’s style. When he was in the Coast Guard, he did a lot of belly crawling in caves on islands. I love that you read about Schoolcraft! I had no idea of his wife’s name or anything about her. Bet she would’ve been someone that would have been amazing to know. I’m going to do some research on her, so thank you for sharing! It was fascinating to read about them both and I’m sure you’ll find the same. The caves in France were ginormous and amazing, hundreds of steps down. The pot holing is very common up North in the UK and that is tiny holes and under threat of sudden flooding. Not good for one who is claustrophobic. Wow, this looks something I’d really enjoyed. 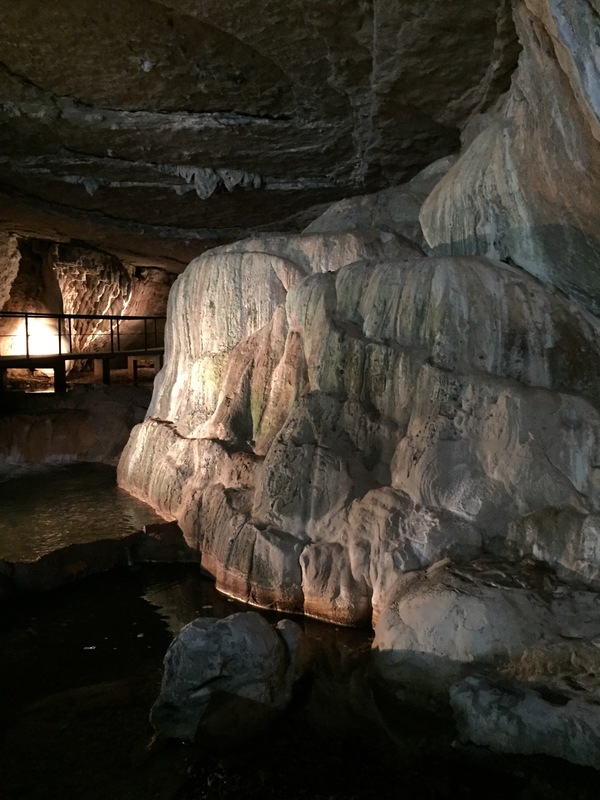 I’ve toured several caves that are open to the public over the years, and have always found them to be very interesting. Fellow cavers! :) Caves are quite intriguing. Most of the ones around here are very documented in their history. We’ve also been to some that aren’t commercial that are pretty neat. Those are the crawl in type. Luckily, they opened up right inside the crawling space. Ah, thanks Karen. What a sweet thing to say. 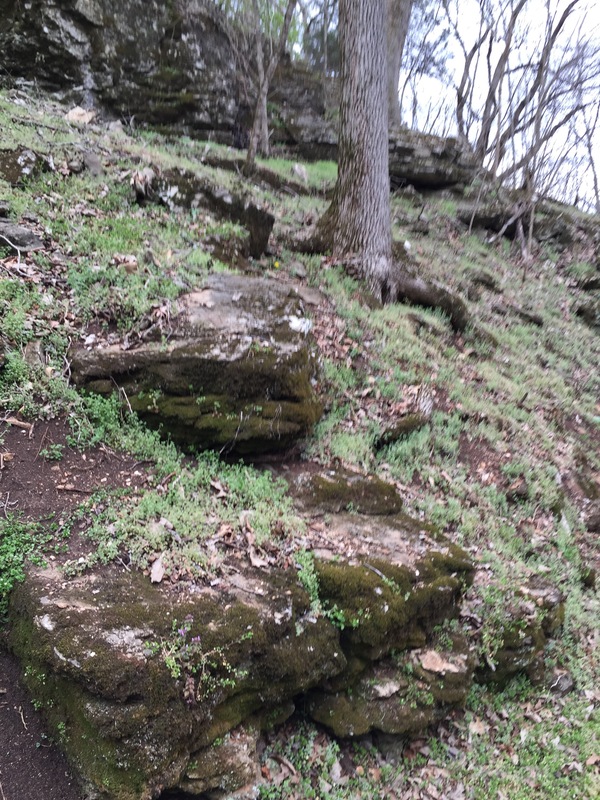 Your husband and kids would probably like a cave about a couple hours from here. It’s steep and skinny going in. Had to lay on our backs and scoot! Ha. Inside, it was so worth it. It’s pathways follow an old river channel. 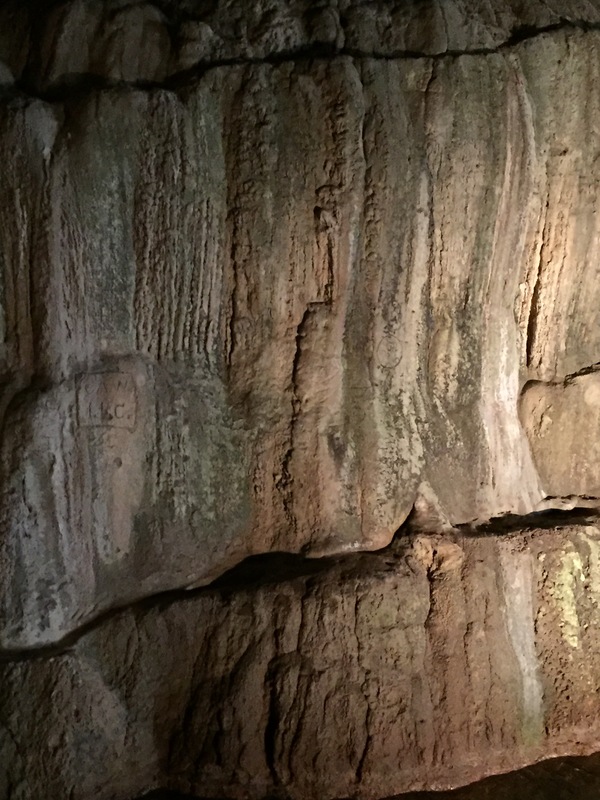 The walls are limestone and sandstone and have thousands of names and dates carved in them. You definitely have to takes lights in. It’s pitch black. It was kind of funny. We were standing at the cave opening which was really small and we were trying to decide if we wanted to crawl into that bitty hole. Ha! :) If it’d stayed skinny, I would’ve backed out! Wow. You sure are lucky to stay nearby a cave Jessica :) The pictures are great and I loved that small waterfall in the back :) I have never been to many caves :D Probably one or two :P But have not seen any with waterfall yet! Wow, very pretty! Love your photos :) I also LOVE tours like that too. And history. They’ve always peaked my curiosity quite a bit. That’s awesome! Something in common! I didn’t know you liked history, too. Did you read Annika’s comment about Schoolcraft’s wife? Some pretty cool stuff. Not only good with a camera but your post is like being on the tour.. Great job and glad you all had so much fun..
35 years later, Mom and I went there on one of our trips and I held her hand in the dark and whispered the same thing.. Just a whole lot quieter, in her ear.. I read your comment to my family just now. You took us on cave tours from the comfort of home! It’s funny that you mentioned the one near Branson. We went to it last year. Those icy looking stones in there are just gorgeous. I love the story of how those women went down in that cave all those years ago. Did you get my email that I received my “prize” ? Hi!!!!! Nice to hear from you!